The late Dale Earnhardt (left) looks on with his son, Dale Earnhardt Jr., as other cars circle the Talladega track during practice for the last race the father won in October of 2000. 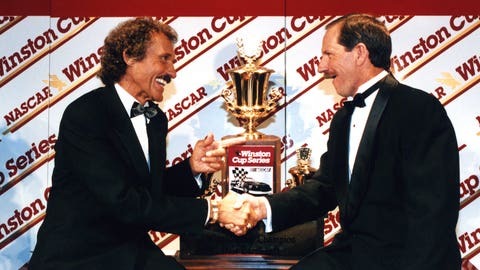 To many race fans, the late Dale Earnhardt was a larger-than-life character. And nowhere did he come up bigger than at Talladega Superspeedway, where he scored his 76th and final career NASCAR Sprint Cup Series race victory in the Winston 500 on Oct. 15, 2000. Earnhardt used a huge push from Kenny Wallace to go from 18th with four laps to go to win the race. It was an amazing and unforgettable victory, with the grandstands shaking as The Intimidator took the checkered flag. Friday at Talladega, Dale Earnhardt Jr. told his side of the story about that race. 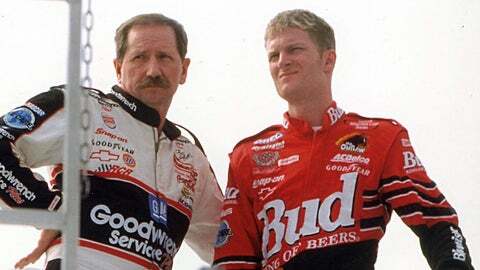 Earnhardt Jr. was a rookie that year, driving for his father’s Dale Earnhardt Inc. team. The younger Earnhardt challenged for the victory before falling back to 14th on the last lap. Earnhardt Jr. was racing with Mike Skinner, his father’s teammate at Richard Childress Racing, as the laps wound down. "I was sitting behind Mike Skinner," Earnhardt Jr. said. "We were in single-file line on the inside and Mike was protecting the bottom. And I was going to sit there until the last lap and try to pass him." Then things started to heat up. I knew that pushing Mike Skinner past Daddy was not going to work well. "Dad’s line formed on the outside and was coming," Earnhardt Jr. said. "And, I could see him in the mirror knocking off a few guys each corner and getting closer toward the lead. And then I had to decide whether I was going to try to pass Mike now, and then maybe battle my dad for the lead, which was probably the best thing I could have done." Still, it was tough to decide the right course of action. "Was I going to push Mike and try to work hard?" said Earnhardt Jr. "Once their line got tires, ours had been kind of stagnant for a while. I think ours would have sort of rejuvenated itself and maybe battled back. And so, I knew that pushing Mike Skinner past Daddy was not going to work well." There were practical issues to consider that most drivers wouldn’t have had to deal with. "I think I was riding home with Daddy anyways," Earnhardt Jr. said, laughing. "I didn’t have a plane then, I don’t think. I knew he wouldn’t have wanted that — for me to do that, you know? You can’t communicate at that moment, but you’re just thinking of about a million things like he’s passing me. "Part of me is pulling for him; the other part of me is thinking I’m not in the situation I want to be in because I thought I was just going to have to try to pass Mike," added Earnhardt. Jr. "That was the only thing I had to worry about until the end of the race. Now, our lane is not the lead lane. What do I got to do to get our lane back into the lead? So now again, it’s against me and Mike. But Dad, I don’t want to push Mike in our lane past Dad. So I started not pushing Mike. I started lifting." That opened the door for the black No. 3 to advance. "Then our line really started falling," said Earnhardt. Jr. "And then I decided coming through the tri-oval that I was going to pass Mike. And I went to the bottom and he stayed against the apron. So he said basically at that point, if you’re going to pass me you’re going into this corner on the apron. And that wasn’t going to work. I was going to wreck myself and Mike and everyone else. So, I had to lift. And when I lifted to get back in line, I fell to like 14th place. Of course we had already lost about five or six spots to Dad’s line. But, it was a mess." It was a disappointing outcome for the rookie driver. "I just sort of felt destructed, mentally, when all that was happening because I didn’t know exactly what I should do, what Tony Sr. (Eury, crew chief) wanted me to do on the pit box, what Dad wanted me to do," said Earnhardt Jr.
What the elder Earnhardt wanted to do was win, which he did. "He won the race. It worked out for him and that was good. It was a hell of a comeback," said Earnhardt Jr. "And it’s great for Kenny Wallace. He seems to really enjoy being a part of that story; and he’s such a great guy and he had a lot of respect for Dad. "So, it’s just great to hear that story. I hate to think about how it went for me because I wanted to win the race. We were just starting to sort of understand our strength at DEI as a plate-track powerhouse. We began to win races after that. I’d like to try it again. I wish we could do it again because I think I would have done a lot of things differently."